Hinduism is a pantheistic religion as it equates God with the universe. Brahma (the creator) is the first member of Hindu trinity (three Gods) consisting Vishnu (the preserver) being the second and Shiva (the destroyer/transformer) being the third. The meanings of Brahma in Sanskrit are growth, expansion, and creation. In this way, Brahma is recognized as the God of creation. He is attributed to the creation of Brahmanda (entire universe) and all forms of life within it. So he is also known as the Creator and the Director of the entire universe. It is said that Goddess Saraswati is the wife of Brahma. She is the God of knowledge and wisdom. Brahma is believed to be born from the Kamal, (lotus) springing from Vishnu’s Navi (navel) as he was laying on the great serpent in the milky ocean. Hence, he is also known as Nabhija (navel born) and Kanja (water born), according to Hindu doctrine. Growing from the lotus of Narayana, Brahma is the name which creates the realm of the universe. He is a symbol of celestials and divine beings of all kinds of nature. Veda states in the Purusha Sukutam that, three main bodies of the Universe (Brahma, Vishnu, and Shiva) are indestructible and they are the subjects to creation, preservation, and dissolution of the whole universe. Narayana is the Sanskrit name given in the Upanishad which means supreme lord. Narayana is the Para Brahma, one who creates unlimited universes and enters each one of them as Lord of the Universe. Brahma creates and operates in various forms of the universe for years and years, then dissolves back into Narayana. Narayana is he who cannot be created or destroyed. Theologically, he is Savayambhu (self-creator). Cosmologically, he is Vishwakarma (master of the universe) and Vidhi (originator). The picture of Brahma like the other Hindu Gods bears mystic imagery. When one comes across statues of the Brahma, the God of Creation is drenched in symbolism. 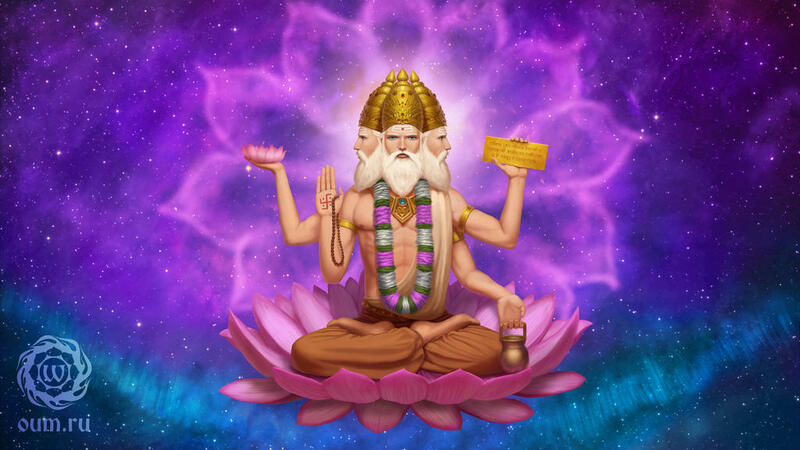 Brahma is unique as he has four faces (Chatur Mukha) and four hands. Brahma is seen sitting on the lotus that designates the infinite truth. Reality is the basis on which his traits rest. The four faces of Brahma embody the four Vedas (Rig, Yajur, Sama, Atharva). The animal hide worn by Brahma stands for severity. Out of his four hands, Brahma holds the Kamandalu in his first hand, which is the symbol of sannyasa or renunciation. Vedas are held on the second hand. Likewise, he also carries rosary (mala) in the third hand which is meant to be used for chanting and meditation. And on his fourth hand, he holds lotus which represents nature and the energy of creation. Brahma is often seen riding a swan, his sacred vehicle for which he travels upon. The swan is supposed to symbolize grace, beauty, and peace. Lastly, the crown that Brahma wears stands for his supreme authority over the world as the King of Creation. Life in this world is the demonstration of the three principles of Brahma that is creation, sustenance, and destruction. All these three principles are interconnected. Destruction, creation, and sustenance are all united. They are like wheels of the same cart. Hence the three Gods of the Trinity viz. Brahma, Vishnu, and Shiva representing creation, maintenance, and destruction, are basically one and the same. According to Hindu philosophy, all creation is the outcome of Vikshepa Shakti which the Lord Brahma contains. Although Lord Brahma is the God of creation, he is not popularly worshipped as Vishnu and Shiva. There are very few shrines of Brahma in comparison to Vishnu and Shiva, even though Lord Brahma has his own significance in Hindu religion.